When I’m not teaching cooking classes, I volunteer as a garden educator for a non-profit organization called Growing Great. I help students at a local elementary school maintain a beautiful organic garden as well as teach them the fundamentals about growing vegetables and fruit. I think it’s really important that our kids know where our food comes from. I am fortunate to have grown up with gardens my whole life. My father has an unbelievable green thumb and we were lucky enough to be able to go to the backyard before dinner and find something that looked good enough to eat. Yet, no matter how many times I plant a seed in the ground, I am still amazed at what happens. With some sun, water and a little TLC, that little granule turns into a gorgeous plant that bears incredible-tasting vegetables. 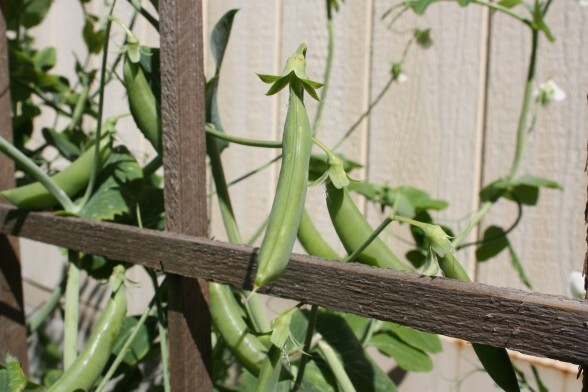 This year our little school garden had a bounty of sugar snap peas. We picked baskets upon baskets of them to sell at the school’s annual farmer’s market, although we would have had pounds more but the kids couldn’t resist eating them straight off the vine. Far be it from me to discourage them! 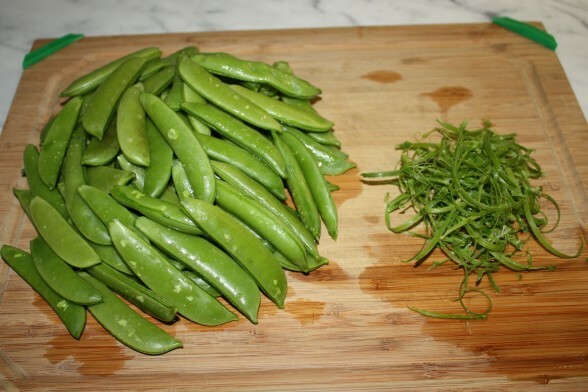 Sugar snap peas are always the most popular spring vegetable that we sell. They are even more sweet and juicy when they are freshly picked — a real treat! They are perfect raw in a lunchbox or as an afterschool snack. But I just love any peas when paired with mint. It’s a match made in heaven. 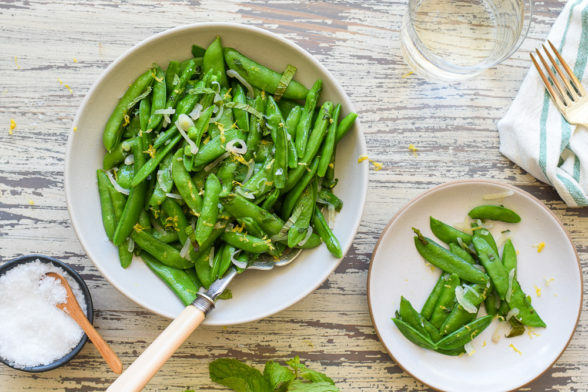 If you can find really fresh snap peas, you won’t have to do much to them to make them taste divine. This recipe is incredibly easy to prepare and delicious in its simplicity. The only “work” here is trimming the peas and I usually have one of my kids do that. Since the peas cook so quickly, I usually call everyone down for dinner and then turn the heat on under the pot. I can always count on a little bickering before everyone settles down to his or her seat, so the timing is perfect. Just keep to the short cook time. I do think snap peas are better with a little crunch. This preparation also works with carrots, asparagus, and English peas, too. If you mix a few together, you’ll just have Springtime in a bowl. In a medium saucepan, add all the ingredients. Bring the water to a boil, lower the heat, cover and simmer for 2-3 minutes or until crisp-tender. Remove garlic if that’s what you used. Season to taste for salt. That's all there is to it. Transfer to a serving bowl and serve immediately. Sometimes I like to add the zest of one small orange, lemon or lime to the pot. « what lurks in your cookware? 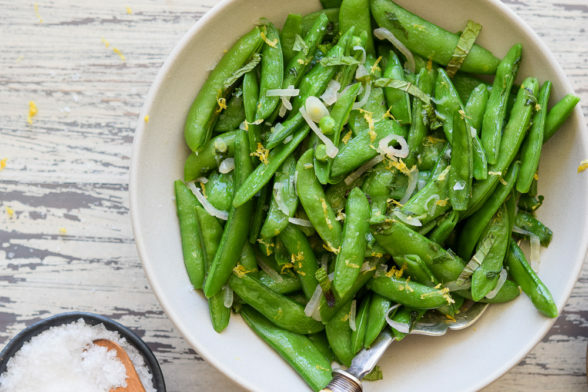 I just made them and LOVED them, as did my 7 year-old daughter who sweared that she didn’t like sugar snap peas right before she tried them. I’m inspired to grow something. Those peas look gorgeous! My son and I love sugar snap peas. I can’t wait to try this recipe. 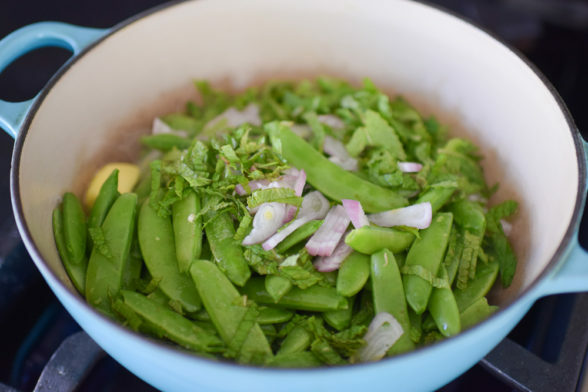 We got some really fresh snap peas at the farmer’s market on Tuesday and made this recipe on Wednesday night. Huge hit with the entire family! We will definitely make this again and I like your idea of adding another vegetable. Asparagus looks good right now. Thanks! Sounds wonderful! How do you shred mint? I’m going to change the wording to “thinly sliced.” I make a stack of mint leaves and roll them slightly. Then take your knife and thinly slice. It’s faster to do it this way, although my grandmother always tore her mint by hand so it wouldn’t bruise. I’m not that patient.